The Village of East Galesburg may be getting a police dog to help patrol city streets for a nominal cost, yet some residents are still unhappy.Village Police Chief Jack Harlan’s day job is as a Knox County Sheriff’s Deputy handling a K-9. In order to have the K-9 with him when he patrols in East Galesburg, he’s asking trustees for $3,500 to install a required kennel in a squad car that he himself donated. “I’ve stated that if the village is willing to go ahead and outfit the car, I’ll pay back every cent just with the understanding that when I go, the car goes with me because I have paid for it,” Harlan says. Harlan seems to have made his intentions clear in report to the police and fire committee but that information was apparently not given to all board members. Trustees Sandi and Daryl Corbin were highly critical that they weren’t made aware. It should be noted that Harlan’s reports were published on a board in the Village hall. Detective Lane Mings with Galesburg Police was at the meeting. 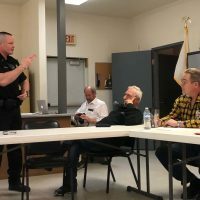 The Police and Fire committee is said to be working on a policy for an East Galesburg K-9 unit that should come to the full board at their next meeting. It was business, as usual, for the Knox County Board at their Wednesday night meeting. 41-year-old Jeffrey Mason of Monmouth entered a not guilty plea Tuesday to felony residential burglary, one of two separate felony cases he’s facing in Warren County. No injuries and only minor damage to a patio door and door frame were reported in a Tuesday morning shots fired call in Galesburg. A new breakfast program began Monday, April 22nd at Steele Elementary in Galesburg.